Easy to use Portfolio Management software which is owned and developed in Australia. Handles a range of investments including shares, options, warrants, managed funds CFD’s, property and more. Allows investors to keep track of their investments and make informed and profitable investment decisions. Compatible with Windows 10, 8.1, 8, 7 and Vista. Free technical support to get you started! Equip yourself with the tools to see strengths, weaknesses, opportunities and threats in the marketplace, or simply update your portfolio and share prices with speed and simplicity. 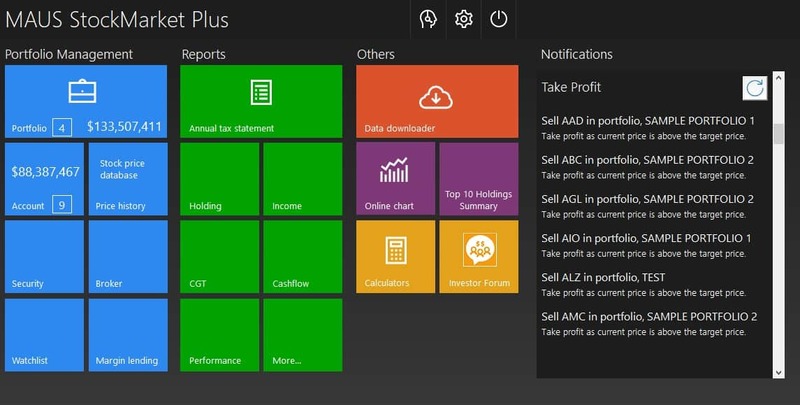 With our premium share trading subscription (yearly) you will be able to manage your portfolio with MAUS StockMarket Plus, while also receiving automatic price updates of your favourite stocks including opening and closing prices, high and low prices, and volume traded at the end of day’s trading. Are you an existing MAUS StockMarket Plus customer? Call MAUS now to obtain your upgrade discount! The software allows you to generate instant end of financial year tax reports, such as, capital gains, brokerage, holdings, dividend/distribution and profit/loss reports which could save you hundreds of dollars in accountancy fees. Let the software do the ground work for you! MAUS StockMarket Plus is fully up to date with all the latest GST, CGT and personal tax rates so you can rest assured you are monitoring your investments in accordance with government legislation. Information related to a trade such as brokerage rates, stock details and prices, the effect inflation may have on your returns, capital gains tax and your marginal tax rate, are documented in clear, easy to follow tables. The premium version of the software provides you with automatic price updates of your favourite stocks including opening and closing prices, high and low prices, and volume traded at the end of day’s. trading. This enables you to have a detailed perspective of the value and performance of your stocks, saving you time and money while ensuring updates to your portfolios without any hassle. This award winning program also covers other important activities such as bank and trading accounts, the ability to manage investment properties and other investment types. The program even includes a range of financial calculators such as, home loans and term deposit account calculators. Tracking shares, managed funds, warrants, options, CFD, fixed interests..etc. Over 15 professional reports including Capital Gain/Loss Report, Transaction Report, Brokerage Report, Holdings Report and a detailed Income Report. 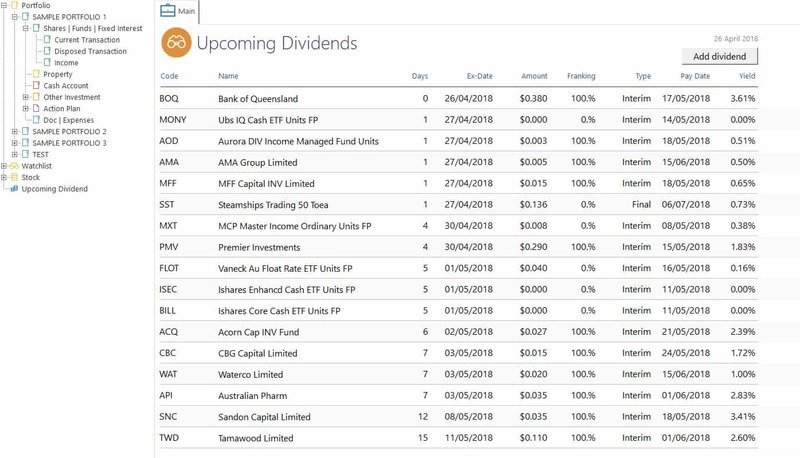 Tracking of your cashflow (dividend) in next 12 months, included the imputation credit. View your past portfolio holdings. Calculate the performance of your portfolio over an financial year or any specific period. Set up target exit and cut loss price. Unlimited number of cash / trading accounts. Easy update your portfolio stock price (subscription required). Import your transaction history from major banks and those who support in Quicken format. Why upgrade from your existing version of StockMarket? 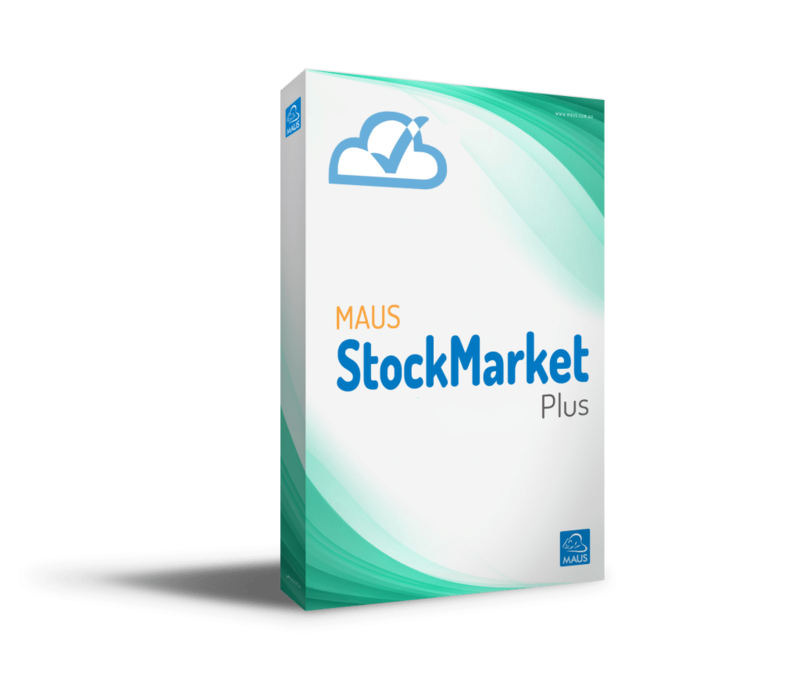 MAUS has helped thousands of people develop and implement StockMarket software. Just give us a call, we’re happy to explain it all. Stockmarket Plus Free Trial – Get Started Today! Explore MAUS StockMarket Plus today!